The currently used English Service of Saint Patrick is a translation of the Slavonic Service composed in the 1970's by Valeria Hoecke of New York and blessed for use by the Synod of Bishops of the Russian Orthodox Church Abroad. The Greek Service was composed in 2005 by Panagiotis Somalis, Protopsaltis of the Church of Saint John Chrysostom in Nikaia, Greece. He has composed about 14 Services in all to the Orthodox Saints of the West, including: 1. St. Julius of Rome, 2. St. David of Wales, 3. St. Patrick of Ireland, 4. St. Cuthbert, 5. St. Columban, 6. St. Martin Pope of Rome, 7. St. Vincent of Saragossa, 8. St. Afra of Augsburg, 9. St. Frederick of Utrecht, 10. St. Boniface of Metz, 11. St. Walburga, 12. St. Eulalia of Merida, 13. St. Samson of Dol, 14. St. Ninian, Apostle of the Picts. Below are a few selections from this Greek Service, which can be viewed in its entirety here and here in the original Greek. The brief life of St. Patrick under the synaxarion is not from the original text (as it does not contain one), but from the synaxarion of Holy Transfiguration Monastery in Brookline, MA. The Service of Praise to our Holy Father Patrick, Bishop of Armagh and Enlightener of Ireland, the Wonderworker. To Be Chanted on March 17th. Tone 1. The Heavenly Orders. You sprung forth from faithful ancestors, O Patrick, and though you first were carelessly living in indifference, you saw the Savior and, Father, you entirely loved Him and were pleasing to Him in your virtuous and godly-minded life. As you were victorious over the ancient serpent, Venerable One, you delivered the isle of Ireland from the serpents, proclaiming to them the Gospel of Christ, God-bearer, overcoming many dangers; wherefore with longing we honor you. Tone 2. When on the wood. When as a captive, wise one, you were carried away and withstood much affliction, Patrick, then you sought Christ the Lord, and listened to Him calling you Father, that the nations may know Him. You boldly proclaimed Him, Who was crucified for us, and rose again, as it is written. Tone 4. Notable in martyrdom. Offspring of Britain, boast of Gaul, archhierarch of the isle of Ireland, let us praise today the godly-minded Patrick, the torch of Orthodoxy, the rebuke of the cacodox, and let the choir of the faithful with one voice cry out: Beseech Christ, Father, for us who honor you. Tone 1. The citizen of the desert. Offspring of Britain, boast of Ireland, who loudly proclaimed the consubstantiality of the Trinity, let us the faithful honor Patrick, the great Hierarch of Christ, who entreats for the propitiation of the offenses, of those who reverently cry out: Glory to Him Who gave you strength, glory to Him Who crowned you, glory to Him Who works through you all manner of healings. Tone 1. Your tomb O Savior. As a brightly shining sun, as a sparkling morning-star, you noetically shined upon, the isle of Ireland, banishing the darkness of impiety; wherefore today, we celebrate your light-bearing memory, with gladness of heart, Venerable Patrick. Tone Pl. of the 4th Tone. The Champion. The most brightly shining luminary of Ireland, and imitator and equal of the Apostles, we assemble together to hymn with joy; having found boldness before the Lord, he entreats that we may be redeemed from all afflictions, those who cry out: Rejoice, Father Patrick. rejoice, the glory of Ireland. rejoice, adversary of the sea of error. rejoice, model and example of a famed teacher. rejoice, for you destroyed the nonsense of the druids. rejoice, for you defeated the dominion of the enemy. rejoice, healer of the sick in soul. On the seventeenth of this month [March], we commemorate our Holy Father Patrick, Bishop of Armagh and Enlightener of Ireland, the Wonderworker. The ray of grace of the Gospel. Saint Patrick, the Apostle of the Irish, was seized from his native Britain by Irish marauders when he was sixteen years old. Though the son of a deacon and a grandson of a priest, it was not until his captivity that he sought out the Lord with his whole heart. In his Confession, the testament he wrote towards the end of his life, he says, "After I came to Ireland - every day I had to tend sheep, and many times a day I prayed - the love of God and His fear came to me more and more, and my faith was strengthened. And my spirit was so moved that in a single day I would say as many as a hundred prayers, and almost as many at night, and this even when I was staying in the woods and on the mountain; and I would rise for prayer before daylight, through snow, through frost, through rain, and I felt no harm." After six years of slavery in Ireland, he was guided by God to make his escape, and afterwards struggled in the monastic life at Auxerre in Gaul, under the guidance of the holy Bishop Germanos. Many years later he was ordained bishop and sent to Ireland once again, about the year 432, to convert the Irish to Christ. His arduous labors bore so much fruit that within seven years, three bishops were sent from Gaul to help him shepherd his flock, "my brethren and sons whom I have baptized in the Lord - so many thousands of people," he says in his Confession. His apostolic work was not accomplished without much "weariness and painfulness," long journeys through difficult country, and many perils; he says his very life was in danger twelve times. When he came to Ireland as its enlightener, it was a pagan country; when he ended his earthly life some thirty years later, about 461, the Faith of Christ was established in every corner. Through his holy intercessions, O God, have mercy on us and save us. Amen. Tone 3. The stars of heaven. As an overthrower of delusion, and imitator of the Apostles, luminary of Ireland, and fervent helper, Hierarch Patrick, we are obligated to honor you. Tone Pl. of the 4th. O the strange wonder. Father, godly-minded Patrick, from faithful ancestors, and righteous you sprung forth, and were carried away as a captive, you sought God, and as you write you remembered Him in your afflictions, and His mercy in your repentance; wherefore your Angel wondrously rescued you from the enemy, and were sent to proclaim the Gospel. Glory. Tone Pl. of the 4th. 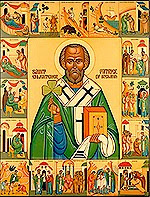 Thus says the Hierarch Patrick to the Orthodox Christians who dwell on the isle of Ireland, on this island where he preached the gospel of Christ: Do not fear, little flock, for through the snares of cacodoxy you go forth, and you dwell among wolves who divide the flock. For behold, I am with you, who in you sowed the seed of piety and delivered the people from the delusion of the druids. Only live rightly according to the Gospel, and gather in the faith as one soul, and do not be frightened by anything that you may suffer, and I will ceaselessly pray on your behalf, entreating for the remission of your sins and the great mercy. 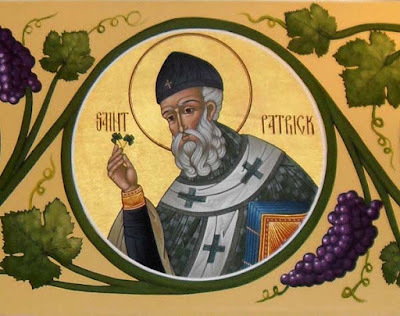 Rejoice, imitator of the Apostles, and divinely-wise enlightener of Ireland; rejoice, the great champion of the Trinity, all-blessed Patrick, our support. From your revered relic, one of many most-devoutly acquired, Father Patrick, we receive divine blessing, magnifying you.